Water – how much really depends on how soupy or thick you want it! There’s not too much prep work to be done at home for this meal. Unless, for example, if you’re going out for a weekend trip, you could easily cook up chicken breasts at home, chop them up, and pack them out with you. I bought frozen, pre-cooked chicken, that was also already cut up into small pieces and split it up into smaller serving size ziplocs at home. And I fill up my small travel bottles with oil, soy sauce, and hot sauce at home, as well. Usually only halfway full for short trips. When you’re ready to cook dinner, add water, some oil, your Rice Noodles and dehydrated veggies to your pot. Boil the rice noodles and dehydrated vegetables until they are softened all the way, or almost all the way, and most of the water is evaporated/soaked up. Then add in your chicken (or tofu or tempeh or Vegan primal strips!) so it gets hot, too. Turn off your stove after everything is softened and hot. Then add in extra oil if needed, or wanted for extra calories, hot sauce to your liking, and a few spoonfuls of soy sauce. Also add in a good dollop, or more, of peanut butter and stir it the best you can. Let it sit for a minute or two so the peanut butter melts, stir again, and enjoy! This is seriously my most favorite trail meal! And I make it at home as much as I can get away with too! Bonus tip: As soon as I get to camp and start unpacking my pack, I like to get out my dinner and pot, and let the rice noodles and any dried vegetables soak in some water while I set up camp, fill up my water bottles at the water source, etc. Then bring it to a boil and start cooking after it’s been soaking for a little bit. Have you tried this recipe? Made some variations? Let us know in the comments below! 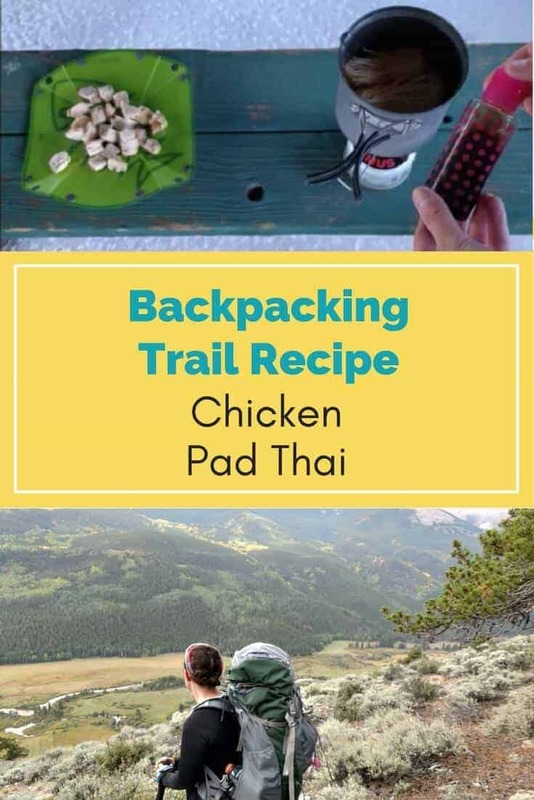 The post Backpacker’s Pad Thai Recipe appeared first on Your Adventure Coach.